Thailand is the perfect place for every kind of traveler, especially for the beginners cause its exotic, cheap, vibrant and safe. On the one side jungle, mountains, heavenly beaches and crystal water, on the other clubs, parties, and amazing Asian cuisine. A country of contrasts of poverty and cultural richness where the average European feels wealthy. Getting around the country is easy, with a great shuttle service and nice people. Accommodation: Generally is cheap, of course, in the most touristy places such as Bangkok, the prices are very European, but it is still possible to find a bed in a dormitory from 200 Baht. Regarding double rooms with bathroom, the cost is from 260 Baht (Chiang Mai) to 700 Baht (Ko Phi Phi). It all depends on the expected comfort. The north of the country and the southern islands are cheaper. In most places of Thailand booking in advance is not required as you will easily find something on the spot. Food: It is super cheap. Street food cost from 40 Baht for a healthy portion of rice noodles with vegetables or rice with chicken. In restaurants, these prices do not exceed 100 Baht per dish. For Western dishes rates are much higher. Something like Pizza, hamburger or steak will cost about 300 Baht. Breakfast sets start from 70 Baht. However, this is a paradise for fans of smoothies and freshly squeezed juices which cost 20 Baht each. Regarding the alcoholic beverages; in restaurants & bars, the beer starts from 50 Baht per 330 ml and 90 Baht for 600 ml. So, if you are in “saving mode” it is better to buy it in the 7-Eleven convenience store. Transportation: Is cheap and easy. In Bangkok, the main means of transportation are the Skytrain and the subway. The cost depends on your route between 15-50 Baht. The local buses cost 8 Baht, but it may be difficult to use it, as the driver stops randomly and the stops are poorly marked. A taxi starts from the amount of 35 Bath. Motorbike taxis all over the country (wearing orange vests) will charge you around 35 Baht for a short trip. National buses are well organized and you can easily buy packages for backpackers (bus+boat) at a better price. Train service around the country is cheap. Day trains cost from 50 Baht and the night trains start at 550 Baht. Boats to/from the islands cost between 200-800 Baht. Activities: The most popular are; diving courses that cost about 10,000 Baht or a one day dive for 2,700 Baht. If you are looking for good trekking, go to the north of Thailand (Chiang Mai and Chiang Rai). All over the country you’ll find places that do cooking classes for around 15$. A day among the elephants will cost 2,000 – 3,000 Baht, a visit to the Tigers Kingdom it cost around 500 – 1,200 Baht. The entrances to the temples and museums are paid and due to the fact that we are foreign, we pay double. Visa: Around 49 countries, receive a free 30 day Tourist Visa Exemption upon arrival into Thailand by air. However, if arriving by land you will only receive a 15 days period of stay. IMPORTANT – Passports must be valid for up to 6 months before entering.For more information and contact details, here. Food: Do not be afraid to eat on the street. Everything is fresh from the garden of the seller. It is their only way to maintain so they care about their products and clients. Transportation:Always ask to turn on the taximeter! It may take you a while to catch an honest taxi driver but you always end up finding one otherwise you can overpay up to 300 Baht. Do not use the Tuk Tuk in Bangkok. There is no fixed pricing, so after long negotiations, even if you agree to the given price, the chances that you will reach your destination is small. It is the largest group of scammers who’ll drive you along the way to the store, where the convincing salesman persuade you to shop and your driver will get a percentage of the transaction or a voucher for fuel. Right after he will disappear. Bargain: When booking trips or buying souvenirs, better if you always go two streets further than everyone else. For sure you will find cheaper prices. Best time to visit: We recommend you to travel between November and April due to the weather. However, this is a high season and the popular cities and attractions will be overcrowded with tourists, and the prices will be higher. Between June and October occurs the rainy season. It is still warm but you have to be prepared for the cloudburst. Be your guide: Plan your trip well and try not to use organized tours by travel agencies. You will save money and your visit will be more authentic. Ko Lipe “Paper Island” in the local Sea Gypsy (Chao Ley) language, is the most southern island in Thailand, located 60 km from the mainland. It makes a part of Tarutao National Marine Park and on a clear day, you can see Langkawi Island in Malaysia…Read more. Chiang Rai was our last destination after almost one month traveling through Thailand. Well-connected with Chiang Mai by a 2 hours bus trip (130 Baht) this little northern town still had a few interesting and fascinating places for us to visit…Read more. It was a long travel from Ko Tao to Surat Thani airport but a quick flight to Chiang Mai. The second largest city in Thailand, becoming increasingly popular among overseas travelers as word spreads of being a cool and charming city with a huge artistic scene…Read more. Thong Sala pier was full of backpackers heading to Ko Tao after the Full Moon Party craziness. A tiny tropical island of the Central Gulf Coast of Southern Thailand, also know as Turtle Island due to its shape. A paradise for divers…Read more. We left from Phuket to Surat Thani very early in the morning. Five hours trip with some stops in between till Donsak pier. When we arrived, the weather was much better than the previous days, it looked like the monsoon season was over…Read more. 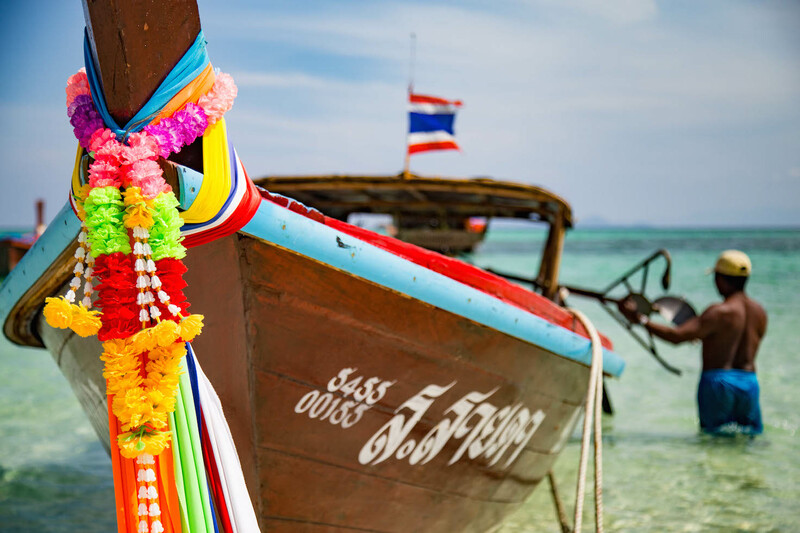 From The hustle and bustle of Bangkok, full of goods, colors and different tastes to the white sand beaches and crystal waters of southern Thailand. The time to explore our most anticipated place finally came. As beach lovers we couldn’t wait for it anymore…Read more. Land of smiles here we are searching for our moments of yūgen…Read more. Bangkok marked the beginning and the end of our 101 days trip through Southeast Asia. We realize how lucky we were to have enough time to explore such a beautiful and interesting part of the world…Read more. Thanks joe 🙂 we are working hard for it! The street food may be safe but what about the water its cooked in,does it come from bottles or contaminated tap water,which comes from the river? Everyone says the tap water is not contaminated, but people still tend to avoid drinking. From what he heard, the problem is not so much the water when it leaves the plant, but rather the old pipes it passes through. During our travel we both never drank from the tap but we always brushed our teeth with it and we never had any problem. Regarding the food, we ate in several kinds of places and we never had any negative issue with it.